Instant Ice Melt granules work faster than rock salt, are more friendly to pets and humans and are the perfect solution for helping to avoid icy slips and falls. INSTANT MELT works faster at melting snow, ice and frost than rock salt. It is a compacted granule consisting of magnesium chloride, sodium chloride and corrosion inhibitors. When applied before a freeze, it helps to prevent ice formation. Once applied to pre-existing ice, it penetrates into the surface causing it to melt from below and break up more easily underfoot. Instant melt is safe to use on concrete and steel/iron surfaces (Bridges, fire escapes etc) as it is non corrosive compared to many other ice melt products. It also contains corrosion inhibitors to help protect these surfaces. 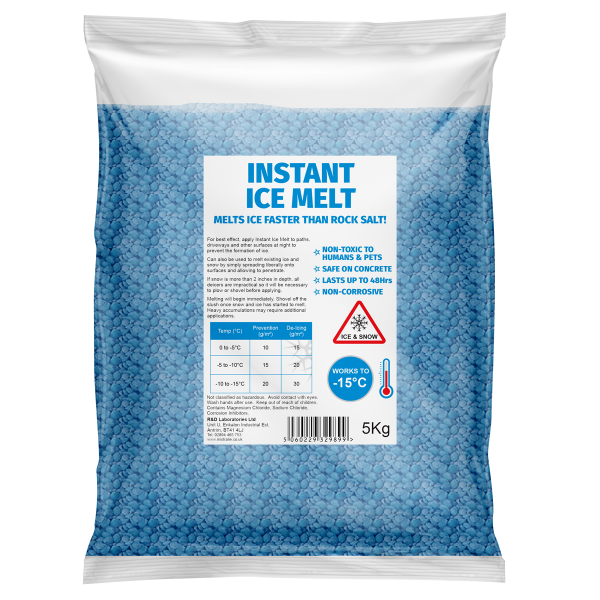 These ice melting granules are perfect for use on public amenities such as paths, roads, driveways, car parks, runways, loading bays and forecourts. Directions: For best effect, apply Instant Melt to paths, driveways and surfaces in the evening before it freezes to prevent the formation of ice. It can also be used to melt existing ice by simply spreading onto surfaces and allowing it to penetrate the surface. Sprinkle liberally onto affected areas to melt snow and ice. Please note that compacted snow and very compacted ice will inevitably take longer to melt which is why we recommend pre-application.